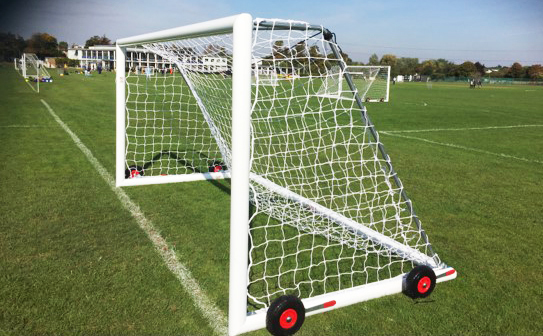 Bushey & Oxhey FC has been awarded a grant from the Thomas Cook Children’s Charity (TCCC) to help us fund new “roll on” goal posts. In the UK, TCCC has raised more than £5 million since 2009 by offering their customers the opportunity to donate when they book a holiday, collecting unwanted coins in store and on return Thomas Cook flights to the UK, and through staff donations. So now you know where your unwanted foreign coins go please keep up the donations! These funds are spent on improving children’s lives and the communities in which they live – by helping to improve education, well-being and health care facilities. Bushey & Oxhey FC were able to demionstrate that we can help TCCC achieve their goals. We are a club with a strong set of values and principles, with a philosophy and ethos that is focused on long term player development and inclusion. We are a non-profit making organisation commited to promoting and enhancing the culture of youth football and sports education in our local community, operated by dedicated parents and FA qualified coaches. We provide boys and girls aged 6 to 17 years with a regular, high quality football experience. The old plastic goal we we had were quite flimsy and prone to destruction in high winds or sometimes, regrettably, due to vandalism as they have to be left in the open. We have now replaced these these aluminium, roll on goals that are fit for purpose, safer during high winds and will reduce the club’s on-going repair and maintenance costs. This project will help to build on the quality football experience we provide for our children, without us having to increase subscriptions costs, allowing all the community to enjoy either playing in these goals or watching family members play. Football is a simple game but providing quality, safe, low cost facilities is a challenge, we hope this project will go some way in enabling Bushey & Oxhey FC to continue to fulfil this objective. Of course, football is also a game that involves two teams; we hope all visiting players will also enjoy these facilities. Many thanks to Thomas Cook Children’s Charitry from all of us at Bushey & Oxhey FC.